Industrial departments across the world have been looking for new ways to attack large industrial fires while minimizing potential risk to equipment and crew. Partnering with Ferrara Fire Apparatus, US Fire Pump has integrated the High Velocity Pump with an industrial pumper to produce flow rates that are completely off the charts. The midship HVP achieves higher flow rates from current apparatus engine configurations. This truck was rated at 5500 GPM from draft and 10000+ GPM from a pressurized source while demonstrating a horizontal reach of 500+ Feet and a vertical reach of 400+ Feet. The new Inundator Super Pumper will forever change the industrial fire industry. Fighting large fires from the ground is one thing, but having an apparatus that can provide high flow rates from extended elevations can be critical and lifesaving. 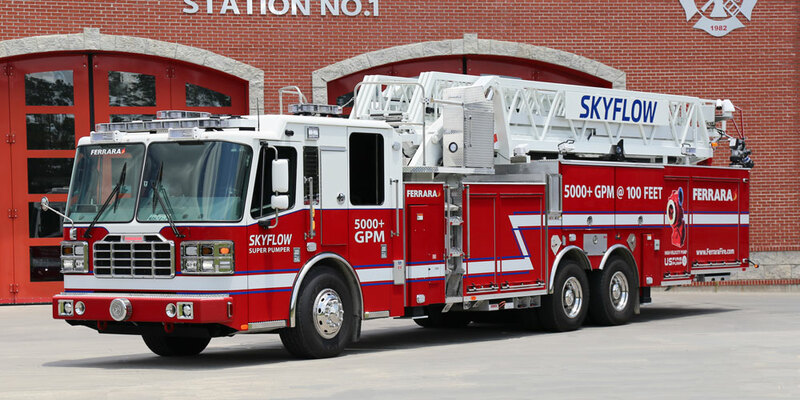 The SKYFLOW Super Pumper class 100’ aerial has been specifically built to serve that exact function. With an aerial waterway configured for delivery rates of 5000 GPM or greater, the Skyflow benefits don’t stop there. Additional exposures or fire ground hazards can be suppressed with the inclusion of dual 2000 GPM rear monitor while flowing the aerial waterway! Accuracy in foam solution metering for such large flows is critical for both application rates and economic concerns. The Skyflow is provided with the Foam Pro AccuMax 3300 multi-point, direct injection foam system to meet those challenges while minimizing waterway restrictions common with other foam systems.